Issue 39: Marx Rev War and Johnny Tremain! The year is now 1957. The rotund toymaker, Louis Marx, is friends with the new president, Eisenhower, who sits in his kitchen painting Marx toy soldiers. Overhead, an incredible new satellite called "Sputnik" circles the Earth and Cat in The Hat books help kids learn to read - while enjoying the story of an irascible cat in a silly hat who dances into a house where two children have been left alone for the day, overturning every rule their parents tried to teach them. Where were their real parents? Why, down at the Ford dealership, deliberating whether to buy a heavily promoted new car called the Edsel. 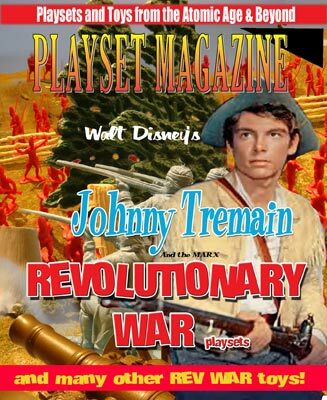 On June 19th (the reason for the theme of this June issue) in 1957, Walt Disney released Johnny Tremain, the story of a lad (Hal Stalmaster, on our cover) whoâ€™s patriotism and youth bring him headlong into history, making friends with Paul Revere and other prominent men of the revolution, clashing with the British along Battle Road, and hanging his lantern on the Liberty Tree (to a snapping good song by George Bruns). Johnny Tremain was originally conceived as a two part program for TV but Walt released it theatrically first, because of costs, in 1957. Then it aired in two parts in November and December of 1958 on his weekly "Disneyland" anthology series. Marx released a select group of Revolutionary War playset, each with a very specific purpose and select exciting elements. We'll sort though them all with you, starting with the great 3404 and ending with Johnny Tremain! As we begin, the British have just sent General Gage and their best troops to Boston to quell a dispute raised by the upstart rebels. The general has learned the Colonists are hoarding powder and guns at a farmhouse and sends Lt. Col. Smith and a column of the 10th Regiment â€˜Foot into the American farmland, out toward the small towns of Lexington and Concord. He will find the American spark has turned to a roaring fire; a thirst for freedom and the birth of a nation. In quelling this small disturbance, the eminent General Gage will find he has just sparked an American Revolution. From there on its battles, cannon and boxes, boys, as the Marx Revolution sparks its own revolution, right here on the pages of PM!